Contact the owner Keith @ 732-742-7042 or keithbrothers@ymail.com. Dimensions LOA: 22 ft 0 in Beam: 8 ft 6 in Minimum Draft: 1 ft 8 in Maximum Draft: 3 ft 0 in Bridge Clearance: 4 ft 6 in Deadrise: 21 ° at Transom Dry Weight: 4370 lbs Engines Engine Brand: Mercruiiser Engine(s) Total Power: 260 HP Engine Model: S - Mercruiser 5.0L MPI with Bravo III Drive Engine Type: Inboard Drive Type: Stern drive Propeller: 3 blade propeller Cruising Speed: 35 mph Maximum Speed: 45 mph Year Built: 2006 Engine Hours: 210 Tanks Fresh Water Tanks: (10 Gallons) Fuel Tanks: (50 Gallons) Holding Tanks: (2 Gallons) Accommodations Number of heads: 1 Electrical Equipment Electrical Circuit: 12V Accommodations A quality, stylish deckboat with seating for Ten, an enclosed porta-potty and a fresh water system. Hull and Deck Anchor/rope locker Forward seating with storage below Walk-thru windshield Helm/companion bucket seats with flip-up bolsters Walk-in console with porta-potty L-shape stern lounge Cockpit table Transom door Integrated swim platform with ladder Additional Features Digital depth meter Compass SmartCraft Diagnostics Two 12V Battery Dual Battery Switch 12V Accessory outlet @ helm Power assisted steering Tilt steering wheel Engine room fire suppression system Insulated engine compartment Stainless steel props Cockpit wet bar with sink Carry-on cooler Built-in ice chest Cockpit table Snap-in carpet Side storage lockers Helm console storage Clarion AM/FM/CD stereo with remote Bimini roof with boot Fresh water shower (Forward/aft) Swim ladders (Forward/aft) Mooring covers LOADRITE DUAL AXLE TRAILER WITH BRAKES Also, I have a fully paid for slip in Brick I would be willing to negotiate as well. 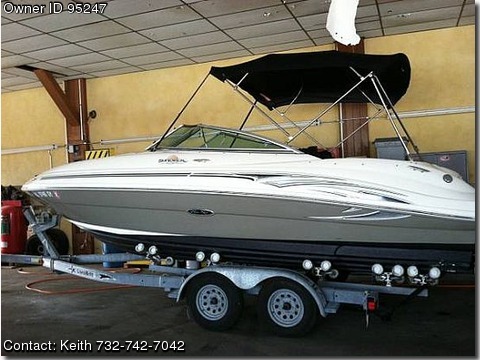 Feel free to call me if you have any additional questions or want to see the boat in person (732) 742-7042. I also have more pictures. The boat runs great and was always marina maintained.